While the 49ers are making headlines for defying pre-season predictions, Alex Smith’s renaissance and a brutally tough defense the biggest thing I took from Sunday’s win against the Giants was the surprise onside kick Harbaugh pulled in the 2nd quarter. The score was 6-6 at the time and every little mistake could have swung the game at that point, so what did the 1st year head coach do? Manufacture an extra drive for his offense. A true surprise onside kick, like the one the Saints did in the Super Bowl, has a far higher chance of recovery for the kicking team than an expected one. All too often the front line of the return unit drop back before the ball has even left the tee. It’s a bad habit that can be exploited. Harbaugh is willing to do that, and every team needs to be aware of it now. The Steelers showed everyone how you beat the Patriots: Throw the ball as often as you can. Roethlisberger threw over 50 passes and the Steelers had the ball for almost 40 minutes. 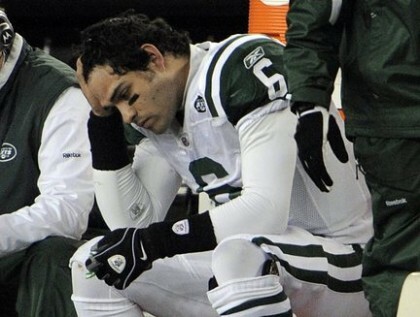 But the Jets simply couldn’t bring themselves to do it. It was right there for the taking. The pats starting line up on defense had 2 people with no intro during the usual SNF roll call. I have NEVER seen that before. Devin McCourty even separated his shoulder after getting lit up by one of them. And yet Sanchez could muster only a paltry 51% completion rate. It only took about 4,000 hits on Cutler before Mike Martz learnt to adapt his offense. But he has, and it’s shown through. The Bears have been keeping tight ends in to pass protect, putting a full back in and committed to the running game and are all of a sudden on a 4 game win streak. Jay Cutler finally looks like a player worth the huge package they gave up for him now he’s not in fear for his life back there. Chicago have a legitimately good offense and continue to play fantastic defense with Peppers, Urlacher, Briggs and the underrated Charles Tillman. They’ll give anyone in the NFL a run for their money. This Colts team has 5 pro-bowlers on it (off the top of my head) and much more talent on the 53-man roster than Detroit’s 2008 offering, so how are they this awful? The 0-16 Lions lost 4 games by a touchdown or less. So far the Colts have 2 such defeats. But the 0-16 Lions only had 7 games where they lost by 2 TD’s or more, the Colts already have 5. My point is this, those Lions tried! The Colts seem resigned, across the board, to losing every game by a lot simply because #18 isn’t there. This is an awful job by every single coach on their staff as well as the front office for not being prepared. When Tom Brady went down in 2008 the Pats had spent draft picks on back-ups and tailored a simple offense for him. The Colts have done no such thing. It’s a poor job. He’s only got 0.5 sacks more than DeMarcus Ware but he’s doing it with less around him in my opinion. Rob Ryan’s defense is blitz-happy and works holes for Ware (not to take anything away from him, he’s an excellent player) but Allen gets pressure out of simple 4 man rushes consistently and also plays the run very well. Allen has recorded at least half a sack in every game this season, something Ware hasn’t. And while both have a shot at breaking Strahan’s single season record (22.5) I think Allen has the best chance. Yes, the scoreboard was not a pretty sight for Vikings fans last night, but Christian Ponder has showed enough in his handful of starts for me to think the Vikes have something with him. He’s shown to be very calm under pressure. The Packers defense had their best game of the season last night and the stat line doesn’t look too great for Ponder: 16/34, 190 yards and an interception, but he’s shown the ability to go through progressions, he can drive the ball on deep outs and can make plays with his legs. The downfield strength is lacking a bit, but that will come as he continues to develop. The records of the teams they’ve beaten: 31-26. For the teams they’ve lost to: 11-16. It’s mind boggling how they can be so very good one week and then miserably play down to their opponents the next. The game plan against the Seahawks was especially mystifying. At no point was the game out of hand. 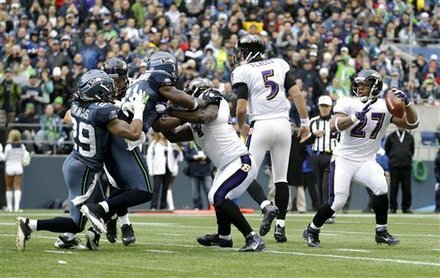 The Seahawks lead 22-7 with 12 minutes still left in the 3rd quarter but Joe Flacco ends up throwing it 52 times! Ray Rice, the best player on their offense by a long way, got 14 touches if you includehis passing TD. That’s criminal. He averaged 5.4 yards on his 5 carries and 6.8 on his 8 catches. WHY ARE YOU NOT GIVING HIM THE BALL MORE!?! Rice isn’t the only running back who seems to get forgotten during games either, LeSean McCoy touched the ball 19 times in a loss and Adrian Peterson just 14 times. One of the big reasons for the Bears 4 game winning streak is they put the offense through Matt Forte because he’s really good. Other teams should be doing the same.